On Saturday afternoon I returned to the tournament hall from Mambo’s, the outdoor oceanfront restaurant at the Cocoa Beach International Palms Resort where the Space Coast Open has been held the past few years. It was shortly before the 3rd round and I trailed behind my wife and sister-in-law, my thoughts mostly on some organizational details to attend to before taking my assigned board. You might imagine that someone who set the Guinness Book of World Records® for the most simultaneous blindfold games—a 48-board, 19 hour marathon performed while riding an exercise bike only six months earlier—would be fairly intense. But not Timur. Although the globetrotting GM had only just arrived back in the States from Europe the day before the tournament, he struck me as very relaxed, soaking up every aspect of every experience life provided, and eager to share it with anyone and everyone. Timur signed one e-mail "Your heart is free. Have the courage to follow it." We had planned for Timur to give a 30-board simultaneous exhibition on Saturday morning during the first round of the 2-day schedule, aimed largely at participants in the 3-day schedule, but late publicity and other factors resulted in only 8 registered players. No problem. 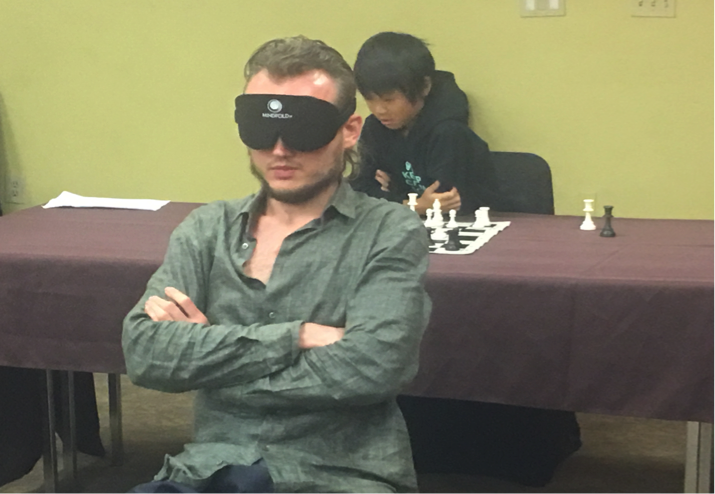 To make it interesting, Timur switched to a Blindfold Simul. 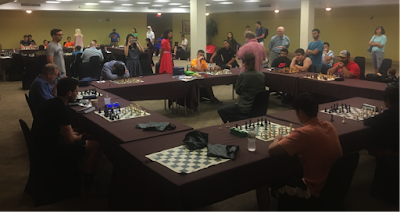 In the middle of the Simul round 1of the 2-day schedule of the main tournament started and one of the simul participants was due upstairs to play. This player wanted to resign in order to start playing his tournament round. Timur would not let him – instead, he stopped playing the other 7 opponents and played out the one game with the player who had to go to the tournament – beating him. This took about 10 minutes. He then returned to the other 7 boards without missing a beat. Timur remembered all 7 positions and continued, winning all 7. The festival also had the unique feature of two simultaneous simuls. While Timur was giving his blindfold simul, on the other side of the ballroom IM Nazi Paikidze was giving an 18 board simul for scholastics players. Six of the participants in Nazi’s simul were also due upstairs at 10 AM to play round 1 of the main tournament. Nazi solved this a bit differently than Timur. Her final score was 12 wins and 6 draws; the draws were graciously given by Nazi so her opponents could start playing their tournament round. 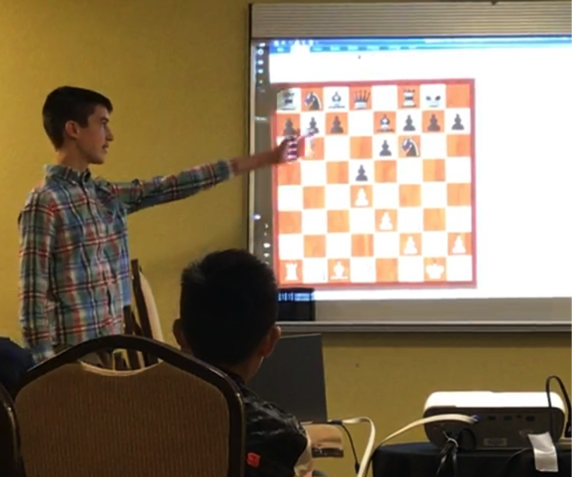 Nazi also gave a lecture following the simul. Special guest writer Tony Burrus has already reported on Timur’s success in taking clear first in the tournament. There were multiple serious contenders for the top spot, with 3 GMs and 5 FMs in the field. The two other GMs trailed Timur by a half point. These included top seed GM Yuniesky Quesada Perez and defending Champion GM Julio Becerra. They were joined by 2 of the FMs in a 4-way tie for second place. FM Cesar José Valido earned his spot by holding Perez to a last round draw, while FM Corey Acor played catch-up by defeating the master-killer Carlos Andretta in their 5th round battle. Of note, the top 5 boards were played on DGT boards (a first this year) and many of these top matchups were broadcast live on Chess24.com (see https://chess24.com/en/watch/live-tournaments/24th-space-coast-open-2017). Expert Andretta faced a murderers’ row of masters in rounds 2 through 5, defeating local star John Ludwig (2481) and Pedro Hernandez-Perez (2297) on Saturday before falling to FMs Valido and Acor on Sunday. Andretta’s final score of 3 points was enough to tie for 1st Expert, taking the marble obelisk trophy on tie-breaks over Theo Slade, Gus Huston, and Miguel Recio. Congratulations are also due to Andretta, a former master, for cementing his rating back in solid master territory, with a post event rating of 2226. Young Mister Slade is a 16-year-old expert who lived most of his life in the UK before moving to Florida in 2015. He has been writing a monthly column for British Chess Magazine since he was 12 years old. In addition to his success in the tournament, Theo gave a well-received lecture on Saturday morning, featuring several of his games. The $50 second brilliancy was awarded to GM Gareyev, also winning with the Black pieces vs. Yan Miellier. “An endgame masterclass by Timur Gareyev. Botvinnik would be proud”, said Maharramzade. “Study this game if you want to learn how to play 2 bishops vs 2 knights endgames”, he said. Gareyev was very pleased with this win, having to overcome a strong defense by his opponent, whose play he praised, “In the 2nd round I had a super tough game with Miellier, who defended well with two Knights vs. my pair of Bishops!” said Gareyev. In Class A, there was a 4-way tie for first place. 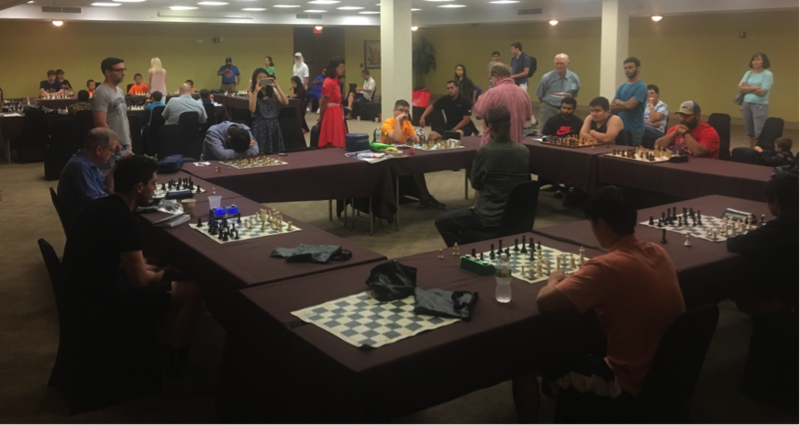 The winner on tie-breaks, Mike Tannenbaum (see photo), is a familiar name at the top of the cross table, having competed in most of the past Space Coast Opens. His record now includes two 1st place finishes, three 2nd place, one 3rd, and two 4th place finishes. Impressive! In commenting on his win Mike noted, “I was very tired Sunday morning after winning all 3 first games. I decided to offer a draw early in round 4 in a slightly better position, which was quickly accepted, so I could go back to sleep and rest before the last round. It worked out nicely as I was able to offer a draw in again a slightly better position to clinch first.” Mike offered a solution to the need for more sleep on Sunday, “The only thing that I would change is moving the last day start to an hour later”! Joining Tannenbaum in the 4-way Class A tie were Joran Torres, (4th round draw vs. Tannebaum), Jancarlo Cruz (5th round draw with Tannenbaum), and Victor Mayoral. Victor took a different path to the shared top spot, losing to Cruz in round 1, and then having a forced Bye in round 2 before going on a tear to win 3 games in a row against higher rated players. In a now familiar pattern, Class B also resulted in a 4-way tie for first place. Robert Simmons took the marble obelisk on tie-breaks over Arnold Banner, Mahendra Sinanan, and Mike Russell. Mike is one of my former US Amateur Team Beach Boys teammates, and was celebrating the 20th anniversary of his first appearance at the 4th Space Coast Open (SCO). Mike shared some thoughts about his experience, “I enjoyed the GM lecture that I attended. When you get insight into the working mind of such a strong player, it is eye opening. The tournament was well organized and rounds started on time. I have won both the A and B sections before. I have also won twice in GM simultaneous at the SCO. Wish I played more often, time and lack of effort have greatly decreased my playing strength but not my love of the battle over the board. 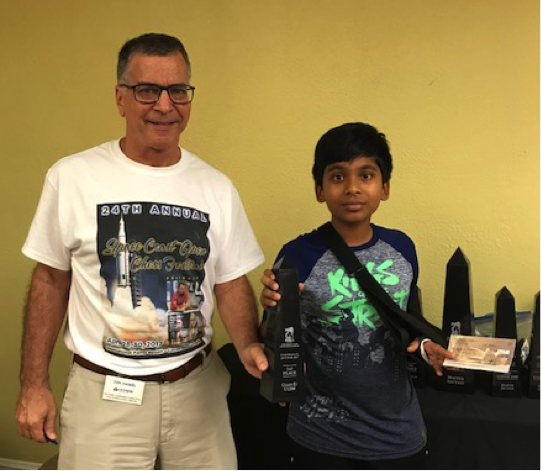 I am fast approaching 70, but still want to Master the Game.” Mike is a player for the love of the game, and put his prize to good use by donating it to the US Chess Trust, “….to inspire our and support the next generation of players”, he said. 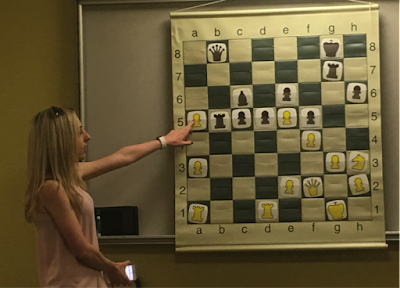 Mike summed it up beautifully, “To have such a great tournament held annually, only 10 minutes from your home, how the Chess Gods have smiled upon me”! By winning clear first in Class C, Andersen Harrill’s prize of $800 was second only to that of GM Gareyev. Only Byron Hu could pass Andersen, who was leading Hu by half a point going into the last round. Their draw secured top honors for Anderson and a shared second place for Hu. Joining Hu in a 3-way tie for second were Angel Barrios and Johnathan Smith with 4 points each. In Class D, Charles Bell and William Wu were leading the section with 3.5 points going into the last round. In their final round match-up, Bell prevailed to take clear first place and a nice $700 payday. “This was my largest prize amount at one time”, said Mr. Bell. 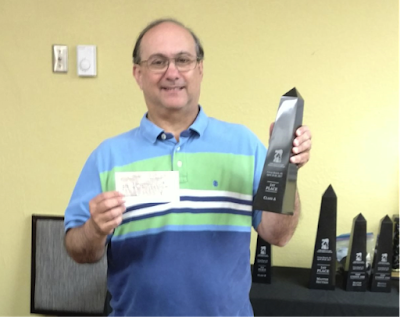 “I also have two Arnold Denker Florida State Championships, U1200 in 2013 with a score of 5.5, and U1300 in 2014 with a score of 5. I go to the Space Coast Open every year with my wife. If we only make one tournament a year it would be Cocoa. Actually, the Space Coast Open was the first tournament I ever won. The 18th Space Coast Open in 2011, U1000 with a prize of $210.00 and a trophy”, said Bell. Back then, Charles sported a rating of only 551, so with his post event rating of 1435 after his first place finish this year, he is close to tripling his rating. Two other players won in the last round to pass Wu and share second place: Kojo Ackah (paying up a section) and unrated Charlie Manter. This left Wu to share the 4th place prize with John Sanchez and Tom Barkasi, both winning in the last round to catch Wu. In the U1200 section, playing with one arm tied behind his back (well, OK, in a sling) Kashyap Tanguturi (see photo) held a half point lead going into the final round and his draw vs. Varshini Venkat was sufficient to win clear first place as the only other player that could catch him, Brian Bird, was held to a draw by Larry Bridgham. This left Brian as the winner of the U1000 oblelisk, and shared second place honors, along with Neel Sahai, Dennis Colak, Varshini Venkat, and Major Croom, all with 4 points. Only three players scored 3.5 points, Larry Bridgham, Leon Cheng, and Andrew Tiansay. The first two were left out of the prize money, but Tiansay was sporting a pre-event rating of only 602, so his excellent result gained him the top U800 prize. The second U800 prize saw a 4-way tie a full point and a half back between Natalia Cereceda, Curtis Lanoue, Sanjay Pooran, and Nick Liu, all with 2 points. It is always exciting to win a prize, even if it is a small one. On learning of his prize, Mr. Lanoue exclaimed, “I had no idea I was even in the running. I'll tell my wife I'm a professional chess player now”! Special thanks to the team that brings you the Space Coast Open. New to the organizing team this year was Jon Haskel, serving both as co-Organizer and Chief TD. As noted by Mike Russell, “…the rounds started on time” and credit for this goes mostly to Jon, along with our calm and capable Chief Assistant TD, Steve Vigil, and Assistant TD Renaud Lajoie. Our book and equipment store was ably run by Steve Cernobyl. 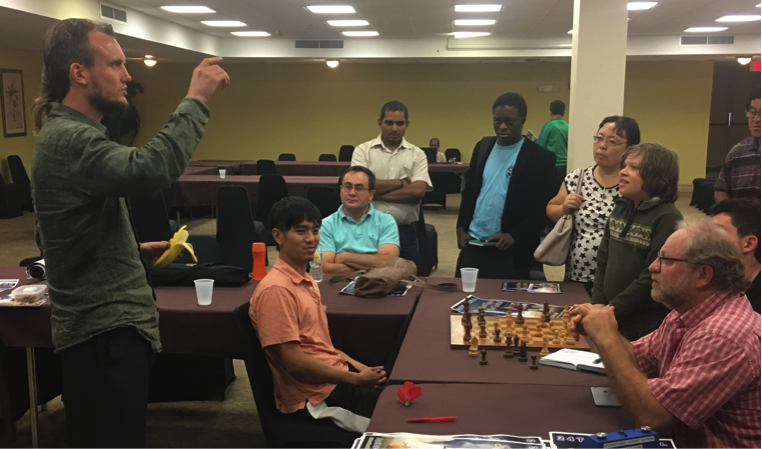 The President of the Space Coast Chess Foundation is Dr. Peter Koretsky. He serves as co-Organizer and the head of sponsor relations, coordinating the fund-raising efforts that support our favorable entry-fee-to-prize ratio, the many side events, and our local scholastics activities. 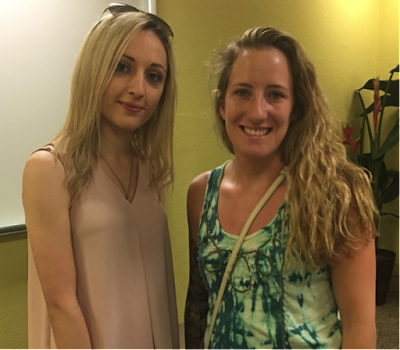 Much appreciated behind-the-scenes assistance was also provided by Brenna Koretsky, Linda Wicker, Alex Zelner, and Chris Bortzner. Thank you to all.